Since natural gas was introduced into cast iron pipes, the jute packing has dried out and the lead has moved. The result is joint leakage. PLCS Encapsulation provides a permanent repair to leaking joints. The proven, permanent solution to bell joint leaks! Don't replace cast iron pipes. Make them as good as new by encapsulating the joints with PLCS products. Over the last 40+ years, millions of joints have been permanently sealed by PLCS encapsulation. Tests by Cornell University (for the New York Gas Group) and British Gas prove 50 years minimum life expectancy. The joint is encapsulated in a tough, flexible layer of synthetic rubber that is permanently adhered to the pipe, yet allows the joint to move. 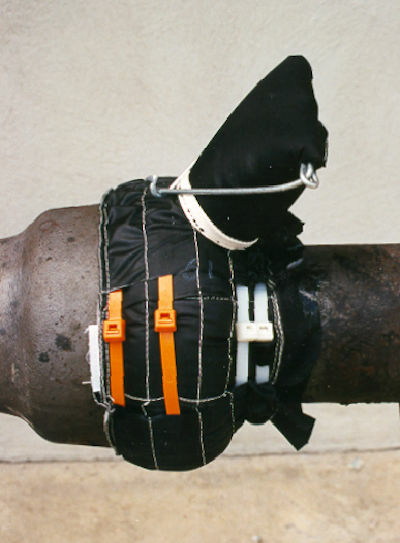 A 6" bell joint can be sealed in less than 15 minutes. Used by more than 50 major gas utilities in the USA.